As spring approaches there a few things to keep in mind. 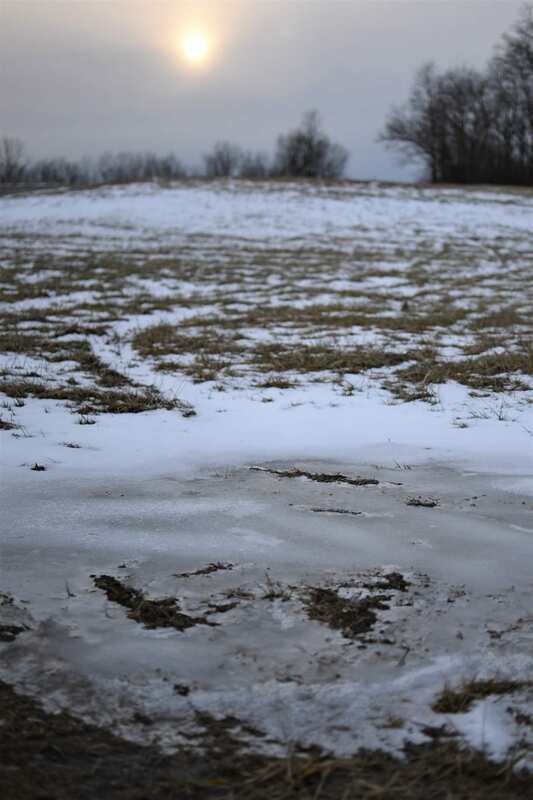 Pasture conditions on many farms are going to be less than ideal. Heavy foot traffic combined with excess precipitation has led to a decline in swards. Spring growth could be hampered as a result. In my travels across the state during the first of March I noticed cows already trying to pick on new growth. Cows going to graze when hay supplies are tight is a welcome change to feeding hay in the mud. 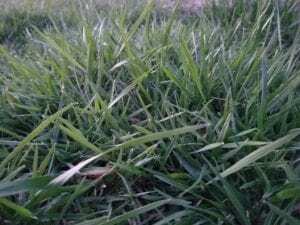 However, the pasture forage will benefit this spring from delaying grazing. Much of the early growth will be supported by plant energy stores until sufficient leaf area has developed for photosynthesis. Continually removing this new growth could further weaken stands or slow spring forage growth. 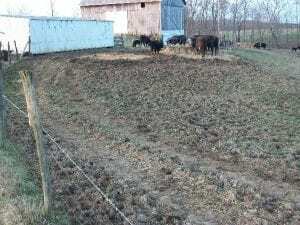 Implement rotational grazing management to provide some rest/recovery time for plants this year. 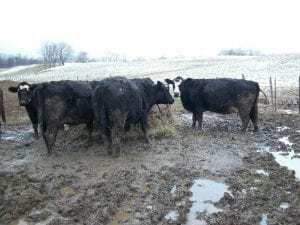 Winter Feeding and Pasture Areas; What to do? 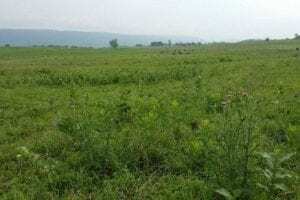 We’ve all had the experience of dealing with pugged areas in pasture fields. Seldom, though, has it been so widespread and extensive. 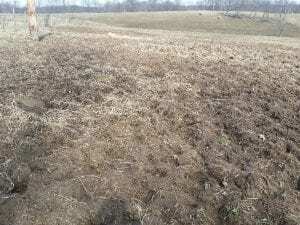 Over the past several months the damage has been caused not only by repeated hoof action, but also rutting made by tractors as hay was delivered to the feeding areas. Degree of damage will be variable, and may call for different reactions throughout the farm, or even within a field. The course of action to repair these areas will be dependent on time and weather. 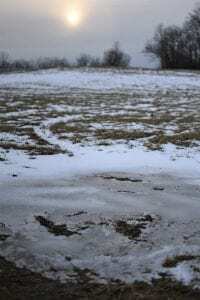 Adding insult to injury, as I write this we’ve yet to have a window of more than a few days without precipitation, and pugged, trampled or rutted fields must dry before any repair work should begin. Forage growth on March 3, 2018 in southern Indiana. Growth has been slower in 2019. March 20th was officially the first day of spring this year. If you look at growing degree days (GDD) for the last month around the state, we have had about thirty percent less than the average. We’ve talked about GDD’s before. Growing Degree Days are calculated by taking the average between the daily maximum temperature and daily minimum temperature and subtracting the base comparable temperature for each day. Days are then added together to compare periods. It is probably the most common way of assessing where we are in plant growth compared to other years, since weather is different from year to year. Round bales had been fed here and the area was very rough from unusually wet conditions. Paddock before being lightly disc and drug one morning when the overnight temperature was 24°F. Last week we discussed how this year many producers have more than normal amounts of pasture that has been moderately to heavily tracked-up by livestock due to the extensive wet soil conditions. 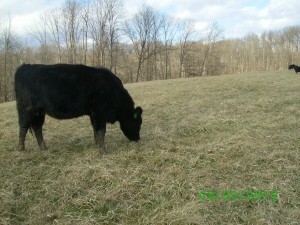 Many of these pastures can use a little help in recovering by adding grass and or clover seed to these fields. Spending a few minutes to calibrate your seeder will help you get the desired amount of seed on the pasture. This will be particularly helpful if you have large areas needing seeded.